Most builders rely heavily on word-of-mouth referrals from existing homeowners. Recommendations from families living in your homes are simply the most believable advertising and the most credible endorsement you could hope for as a home builder. 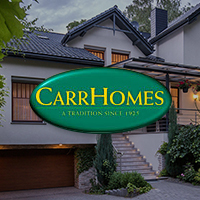 So when we surveyed our purchasers and the results came in with a tremendous 99.3 percent recommendation rate for CarrHomes you can’t imagine how happy we were. No, really you can’t imagine. Thank you to our dedicated staff and to the best homeowners in Virginia.